Free PDF to Word Converter (PDF2Word) Download from FilesPack.com! 2. Standalone software, MS Word, Adobe Acrobat and Reader NOT required! 14. 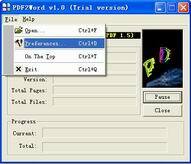 PDF to Word Converter supports five reconstruction modes for PDF to Word conversion; You can free download PDF to Word Converter (PDF2Word) 3.0 now.